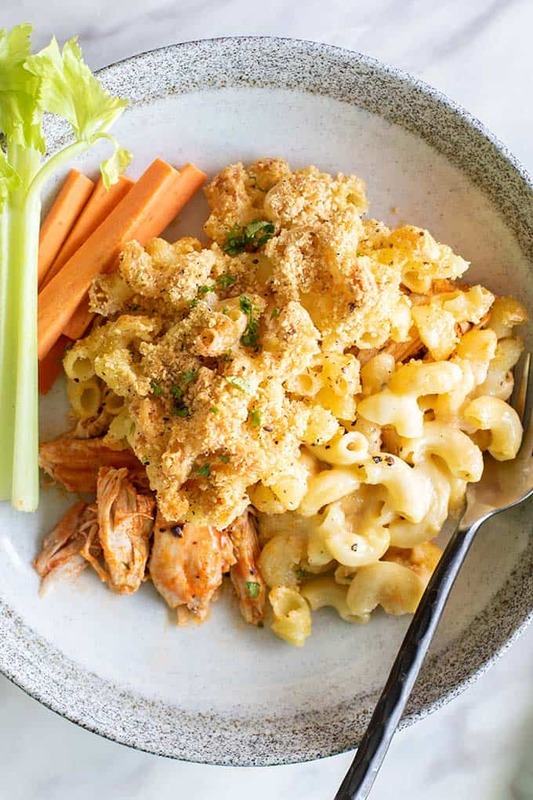 A gluten free Buffalo Chicken Mac and Cheese, for when only indulgent comfort food will do! 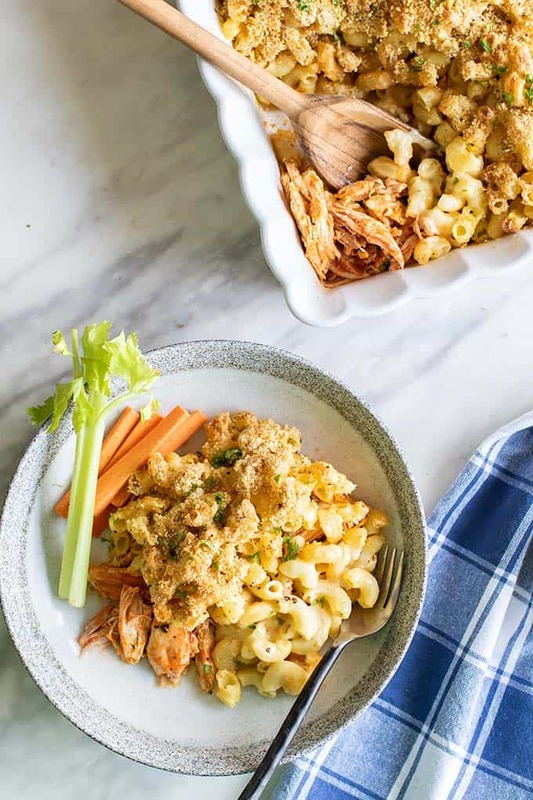 This baked macaroni and cheese recipe is made with a layer of spicy buffalo chicken, and a rich white cheddar cheese sauce. Years ago, I worked in a fondue restaurant. We made cheese fondue at the table — which sounds intimidating, but once you’ve learned to make it, it’s super simple. We didn’t even measure the ingredients! Fondue starts with a liquid base — beer, wine, or even broth, which is what I’ve chosen to use here. The cheese is shredded, and then lightly coated with flour. To keep this gluten free, I used arrowroot. The broth is flavored simply with garlic and mustard powder. Once that’s mixed together and warmed, start pouring the cheese in, starting with about half. 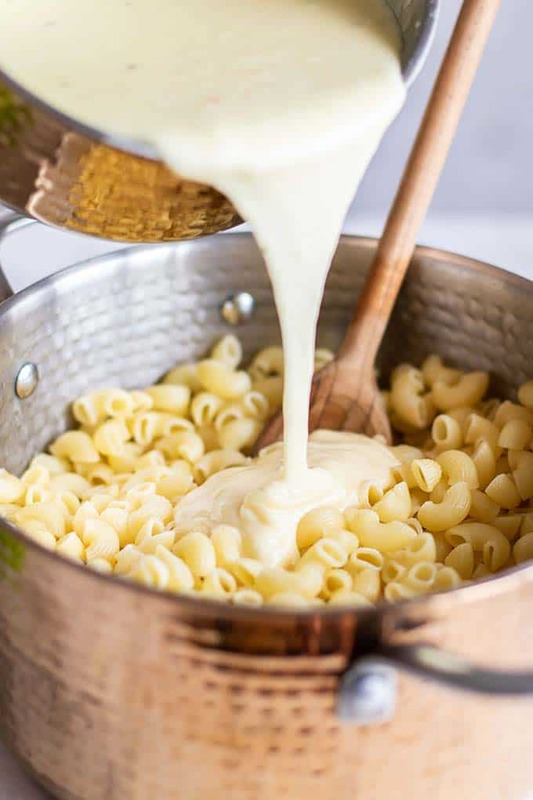 Use a fork to “whisk” the cheese into the broth, and as it melts, it will become a thick cheesy sauce, perfect for coating macaroni noodles. The tricky part in making fondue is having a cooktop that will allow for a low temperature that will melt, but not burn the cheese. I used my Sharp Induction Cooktop for this task. It has a simmer enhancer feature that is perfect for delicate sauces, like cheese, chocolate, or cream-based dishes. I quickly heated the pasta water by using the Power Boost feature (my favorite feature – I am impatient! ), and after the pasta was nearly finished, I started making a creamy cheese sauce. 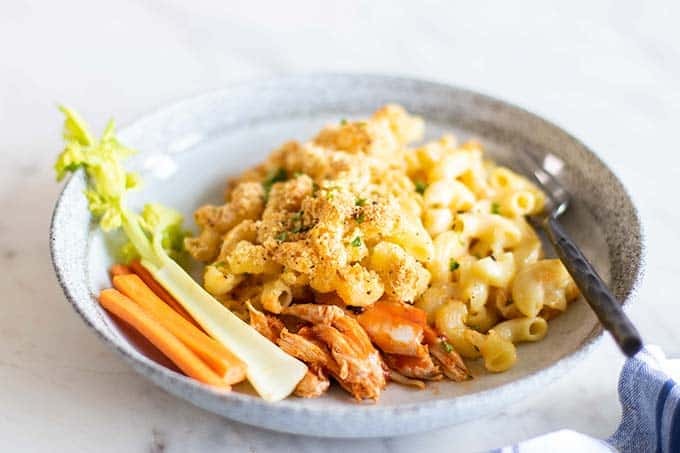 The Sharp Induction Cooktop has a “Keep Warm” function, which makes it easy to cook multiple dishes or components, like this buffalo chicken mac and cheese. It’s best to use a whole chicken in this recipe. A whole chicken takes only 50 minutes to bake in the Sharp Superheated Steam Countertop Oven. Season it simply with salt, pepper, and paprika. I like to add some sage and thyme for an extra boost of flavor. 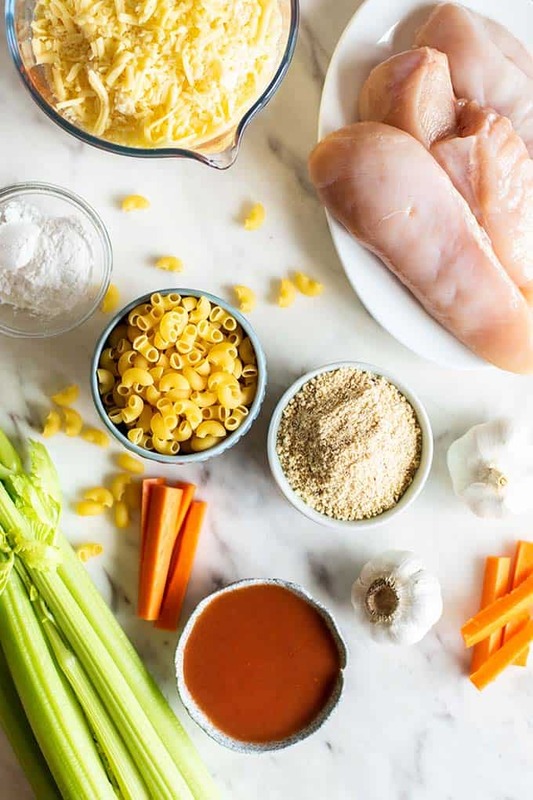 Save time by buying a precooked chicken, if that better fits your schedule! After pulling all the chicken off, it’s as simple as melting butter and buffalo wing hot sauce in a pan, and coating the chicken. You can also do this with chicken breasts — cook them, shred them, and add them in. I’ve made it both ways but we definitely prefer the whole chicken — plus, it makes this dish fast to put together and get in the oven! This creamy comfort food casserole is enough for 8 servings — but instead of heating up my entire oven for 1 casserole, I baked it in my Sharp Superheated Steam Countertop Oven. If you love wing sauce like I do, but aren’t a huge fan of the deep fried chicken pieces, this is such a fun way to enjoy the flavors! 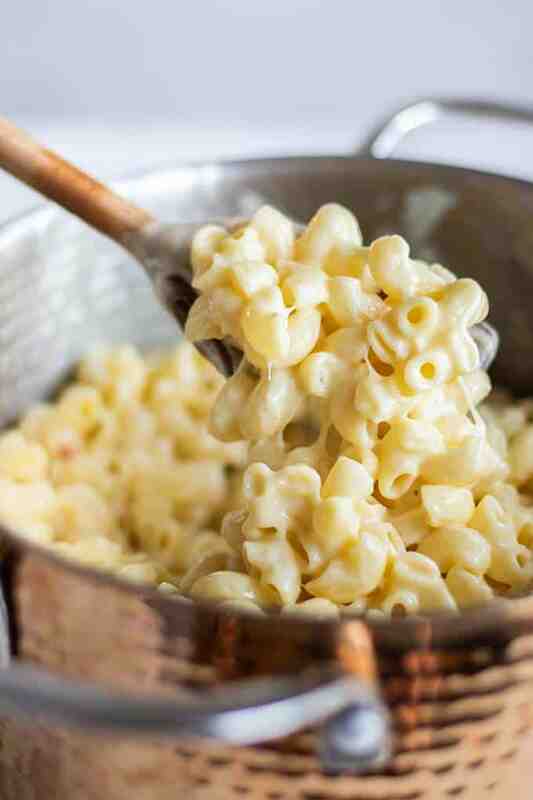 Whisk together the easy cheese sauce — only 5 ingredients! And about a MILLION times better than a store bought mac and cheese! 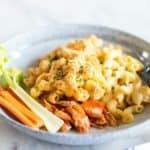 I love a layer of buffalo chicken at the bottom of the pan, topped with the creamy white cheddar macaroni and cheese, and then a crunchy layer of toasted breadcrumbs on top. 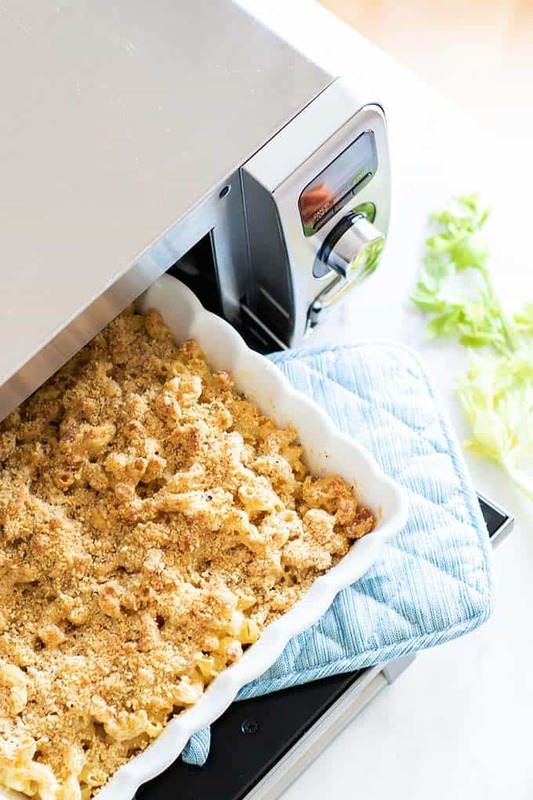 Put it into the Sharp Superheated Steam Countertop Oven, and broil just long enough to toast the breadcrumbs and heat the casserole all the way through! A creamy comfort food classic elevated with a spicy buffalo chicken base! 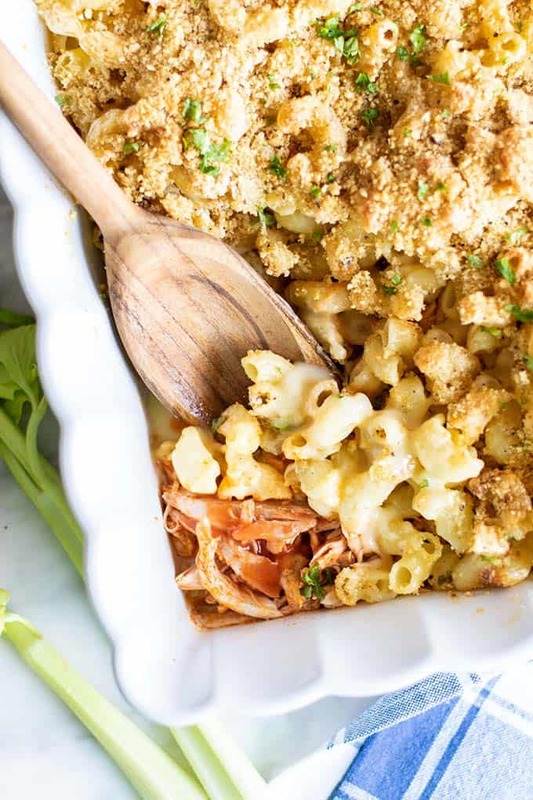 If you're a mac and cheese lover, this is not to be missed! Add the buffalo chicken to the base of a 9x9 baking dish. Add the cheese to the broth, and use a fork to mix it together well. "Whisk" the cheese until a very smooth and slightly thin cheese sauce as formed. If the sauce seems too thick, add a little more broth to thin it out so it easily coats the pasta. 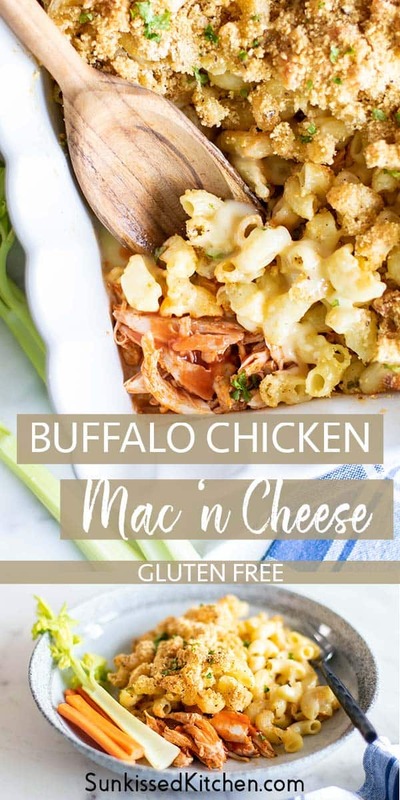 This Buffalo Chicken Mac and Cheese post may contain affiliate links, meaning if you make a purchase, I will receive part of the sale as a commission. This helps me continue to bring you lots of fresh and inspired recipes!